- from beginners to advanced. CALL 517-285-5523 to for availability and reservations. This is an opportunity for students to work on metal clay projects with guidance. This class is for students of all skill levels, including beginners. Learn about metal clay for the first time, or finish up projects lurking in your toolbox. Get advice and assistance tackling new pieces based on those ideas swirling around in your head. Class size will be limited to 4 students. Each student will receive individual attention and instruction at their own pace and skill level. Technical demonstrations will be tailored to participants' interests and needs. Each class session is 3 hours long, and students can purchase a package of 6 sessions for $200. Drop In Sessions: $45 – please call in advance to ensure there is a seat available. Other times and days can be scheduled with the instructor if needed. Tools and equipment are available to use during class at no additional cost. A limited number of materials and consumable supplies will also be available for purchase. Students should also bring their favorite hand tools to class. Firing services are also available. Students should bring their own materials and consumable supplies, or arrange with the instructor to have them available. 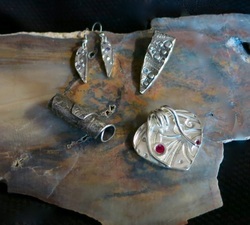 Learn the basic techniques for working with Silver Precious Metal Clay (PMC3) to create pendants, earrings and charms. Instructor provides all tools, supplies, and materials kit. Costs - $100 includes 5 hours instruction, materials kit, use of tools and supplies, kiln firing and finishing. Students should bring magnifiers or reading glasses for detailed work if they need them. THIS CLASS CAN BE SCHEDULED AT OUR MUTUAL CONVENIENCE. For parties of 4 or more, ask about bringing the class to your location!